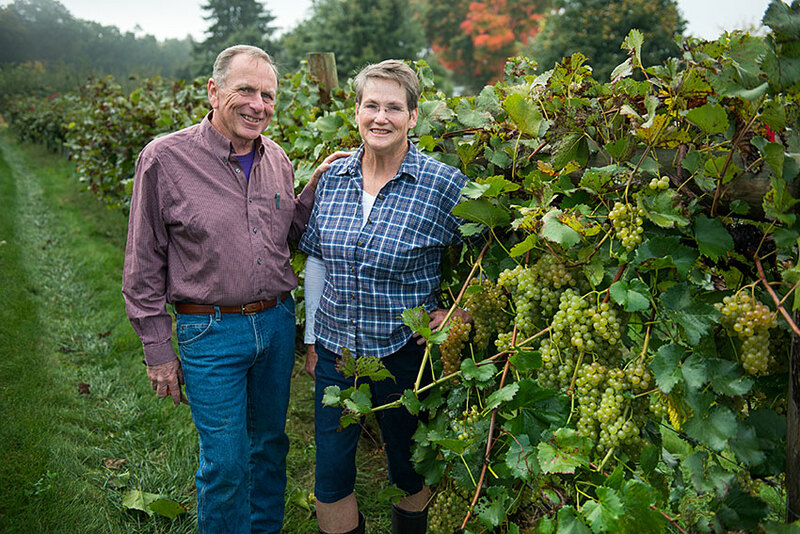 When Joyce and Phil Wiley moved to New Salem in 2004, they discovered grape vines on their property. 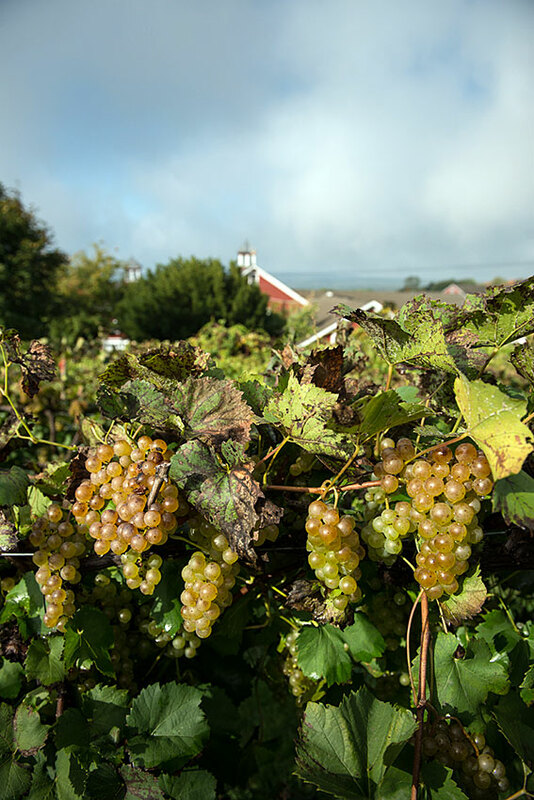 Although the vines hadn’t been tended for several years, they produced many grapes. Joyce made jelly from the grapes and, when she visited their neighbor Fritz who had sold them the property, she proudly gave him grape jelly. 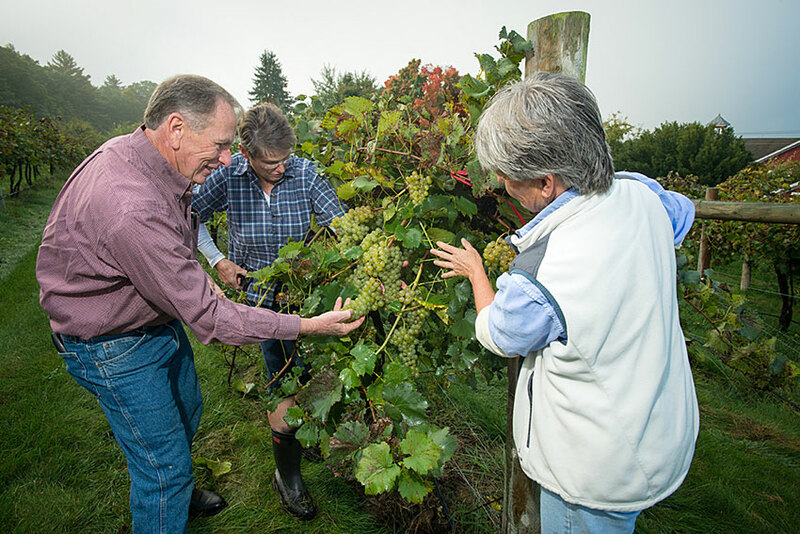 That’s how the Wileys learned their vines weren’t just any old vines, they were many varieties of wine grape vines Fritz had planted over the years on his two-acre property. 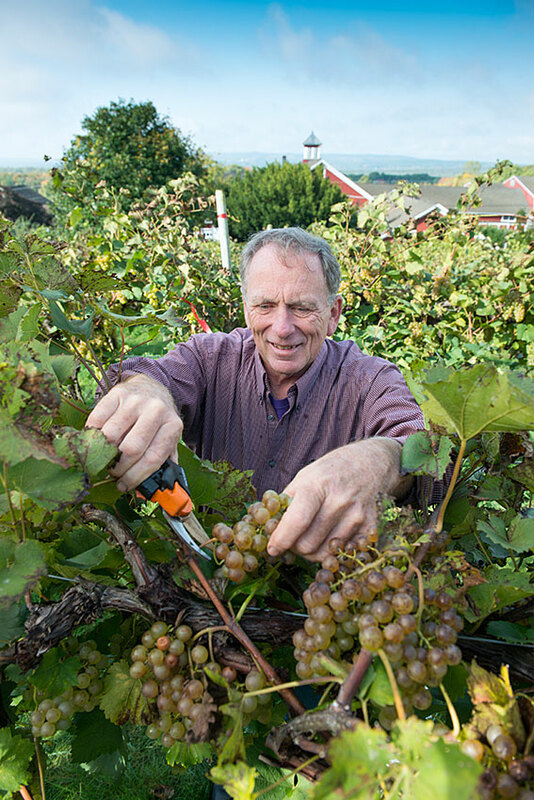 Fritz loved wine and traveled extensively, often returning home with small grape plants in his luggage. Both Joyce and Phil grew up in Massachusetts, but Phil’s commercial real estate work took them to Texas. After 25 years, Phil’s work brought them back to Massachusetts. Then, after retiring, they moved to New Salem. While the Wileys enjoyed wine and vegetable gardening, they had no background in farming or making wine. Fritz had said, “Anyone can make wine, anybody can grow grapes,” but he couldn’t help the Wileys when their grapes died of black rot. A neighbor said, “Call Sonia Schloemann at UMass Extension. She’s an expert, she’ll help.” The Wileys couldn’t imagine that such a seasoned professional would want to help them, with their tiny acreage and lack of knowledge, but desperate, they called. Indeed, Sonia, a UMass Extension educator who has specialized for 25 years in small fruits, was more than happy to help the Wileys as she assists many fruit growers across the state. Sonia willingly answered the Wileys’ many questions about how to grow grapes and how to access additional resources that would be of help. 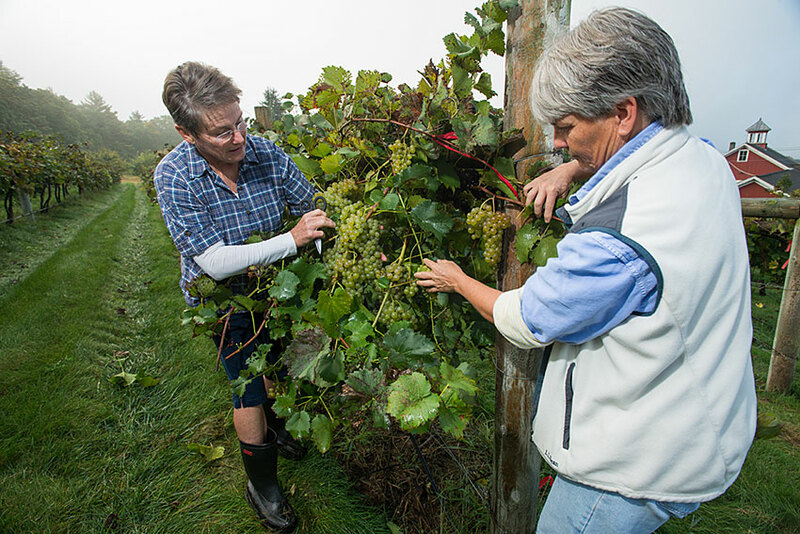 The Wileys mastered the black rot, and gave themselves an education, learning chemistry, math, pruning, spraying, choosing equipment, and how to successfully grow grapes and make wine. Part of their education included attending workshops and meetings at UMass’s Cold Spring Orchard Research and Education Center in Belchertown. 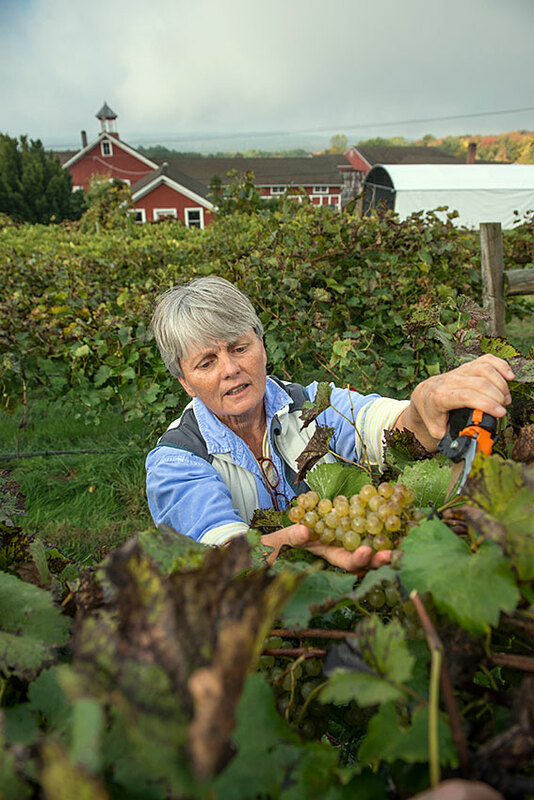 Sonia suggested the Wileys also trade volunteer work at Cold Spring for some of Cold Spring’s grapes to make wine before their grapes were ready. 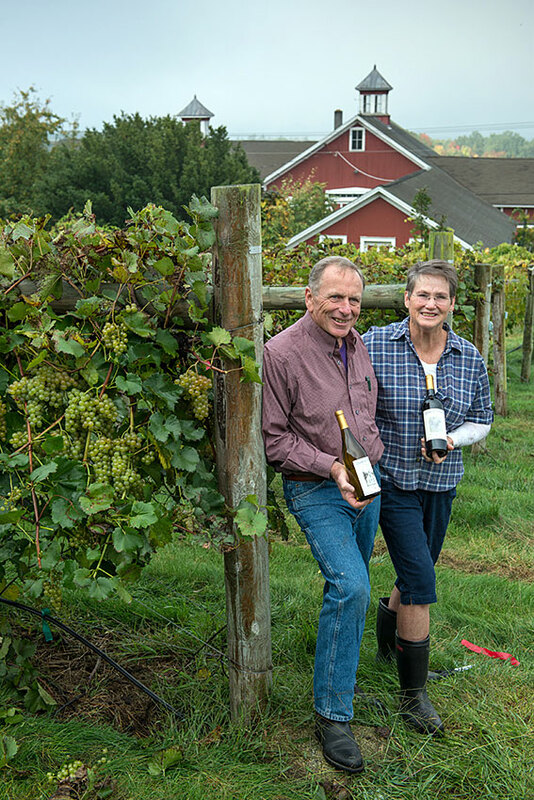 By now, Phil and Joyce have been making wine for six years. 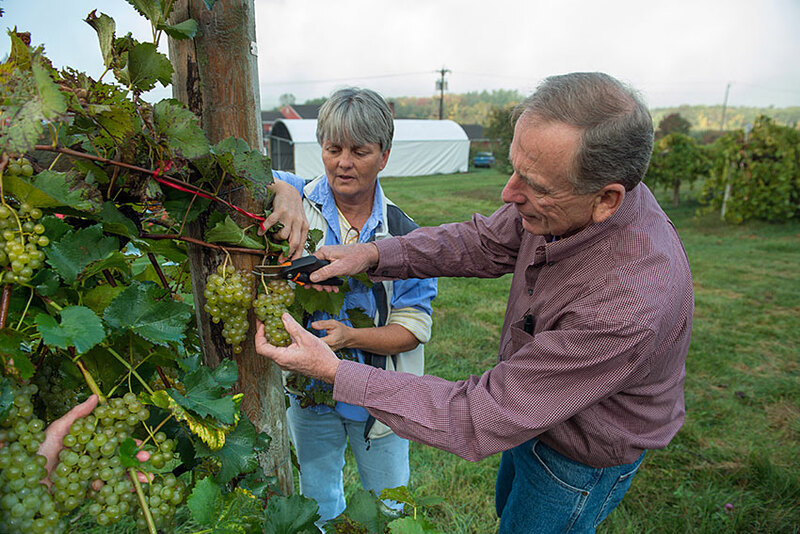 Two years ago, their Quabbin Sky Vineyard became the first bonded farm winery in New Salem. 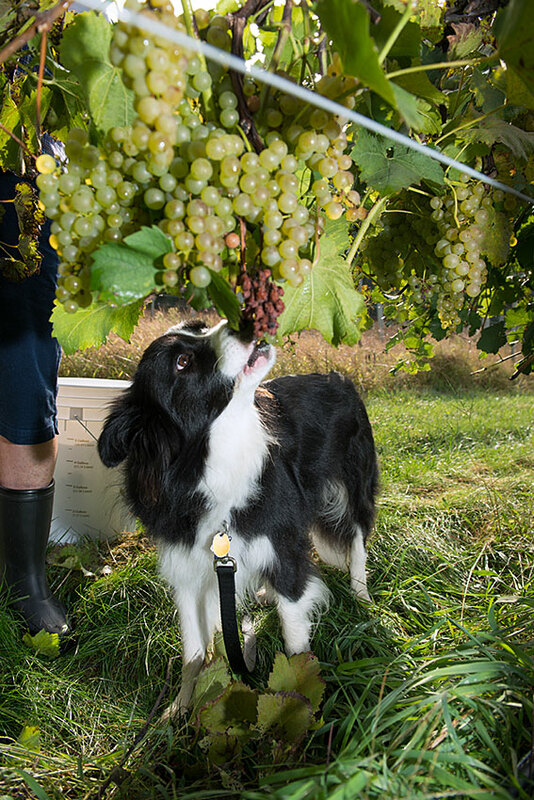 Their winery is named for its location near Quabbin Gate 18 and the Wileys’ grape-eating Border Collie, Sky. Clearly, Sonia and Cold Spring help the Wileys. How do the Wileys support the work of Sonia and Cold Spring? 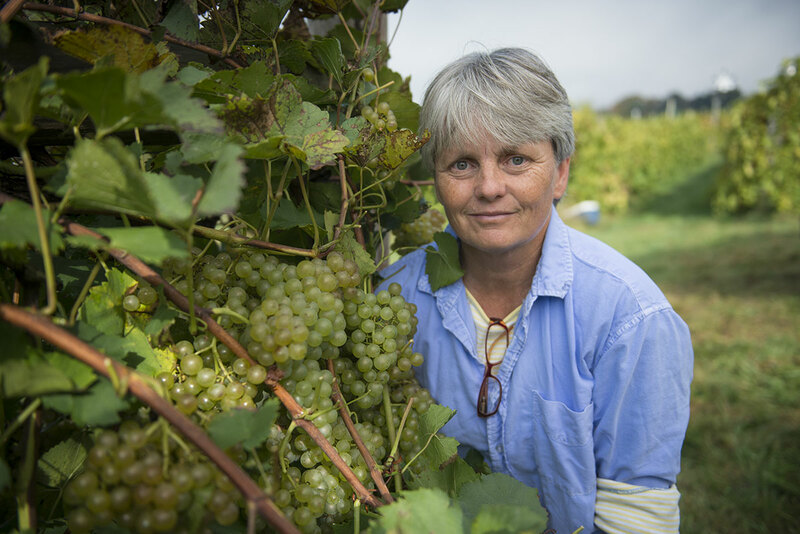 Sonia has been working with Massachusetts vineyards since the mid-1990s, providing information about integrated pest management (IPM) while developing best management protocols for growers. 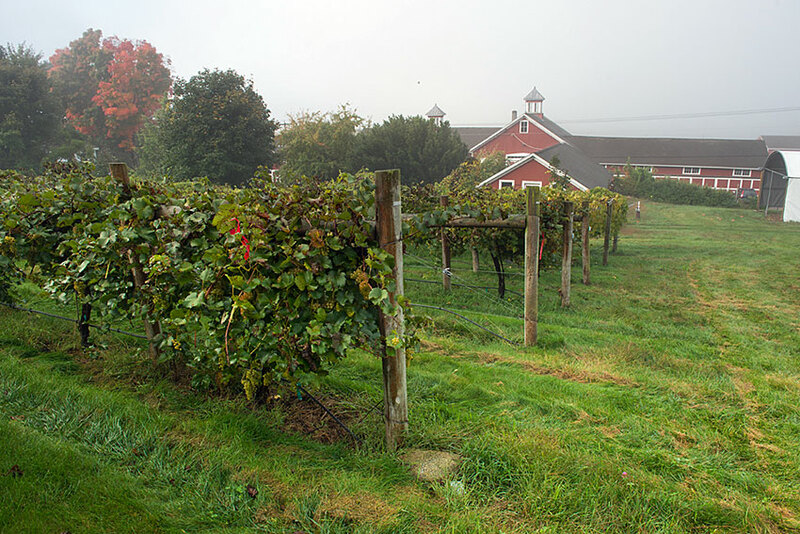 While there have been vineyards and wineries in southeast Massachusetts for 30 years, only with recent introduction of cold-hardy varieties have vineyards and wineries been established in northwestern parts of the state. 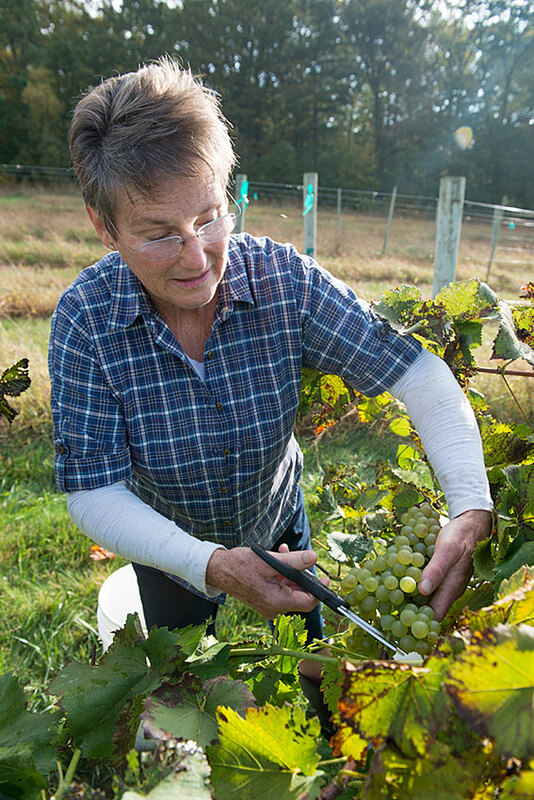 Sonia and her colleagues planted grapes at Cold Spring for the first time in 2001, both for research and for educating growers. 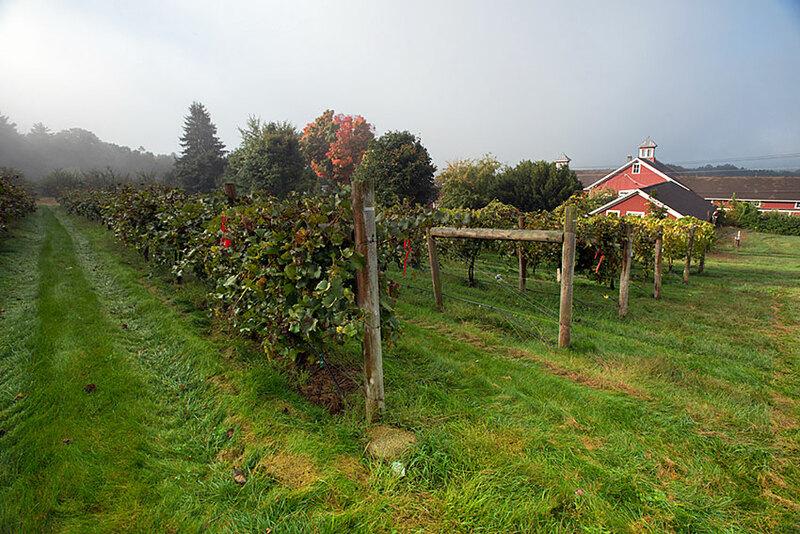 Currently, Cold Spring has a half-acre planted with two varieties of wine grapes: a Minnesota red wine grape variety called Frontenac that tolerates 35 below zero temperatures, and Chardonel, a white wine grape developed at Cornell by crossing Chardonnay and Seyval, which can tolerate temperatures of 15 below zero. 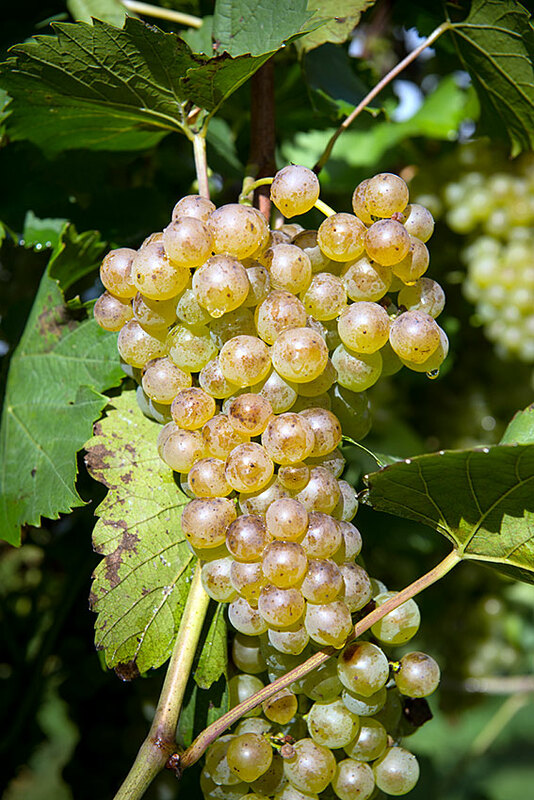 Cold Spring also is growing wine grape varieties in a trial in collaboration with other states as part of a USDA-funded project targeting cold climate wine grape growing (http://northerngrapesproject.org/). 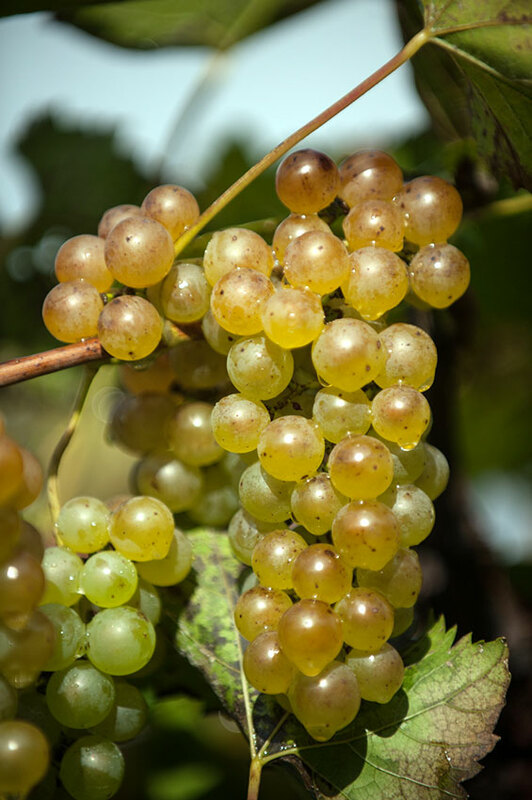 This trial provides an opportunity for researchers and growers to learn about the characteristics of different varieties, how they do in different environments, and the qualities of the wine they produce. 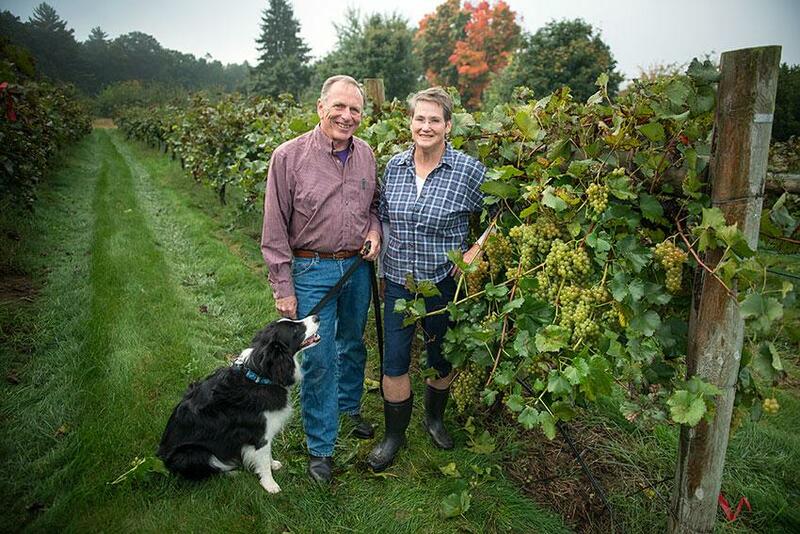 Joyce’s brother and sister-in-law, Roy and Nancy McGuill, were so excited by what Phil and Joyce are doing, they decided to jump into winemaking as well. 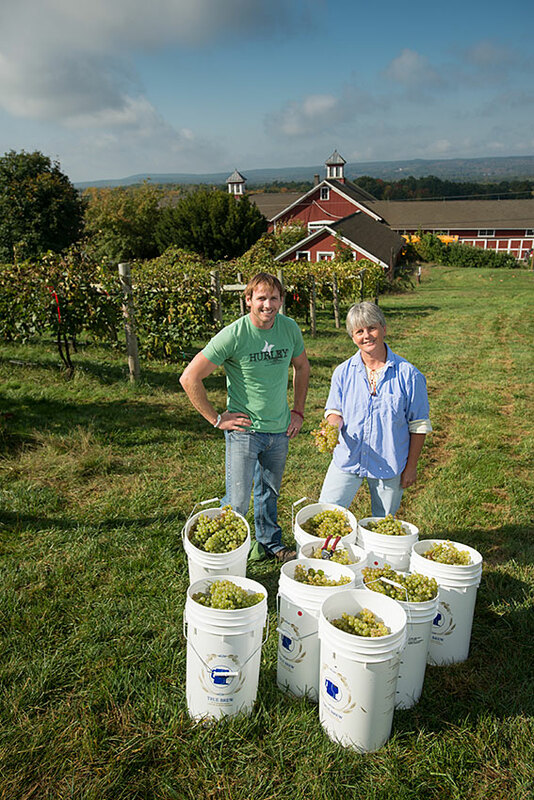 The McGuills recently received their farm winery license for Queen Bee Vineyard in Monson. 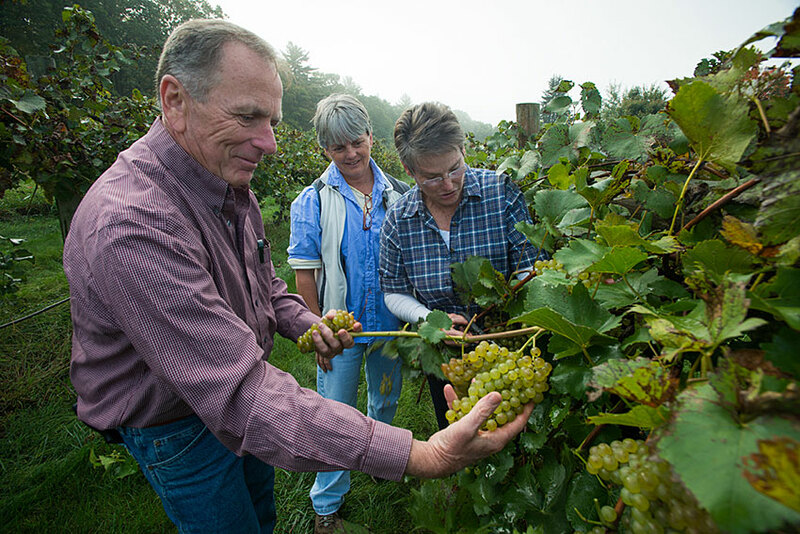 The McGuills, too, will learn from Cold Spring, and, Sonia is eager to learn about the specific issues they encounter growing grapes in Monson. 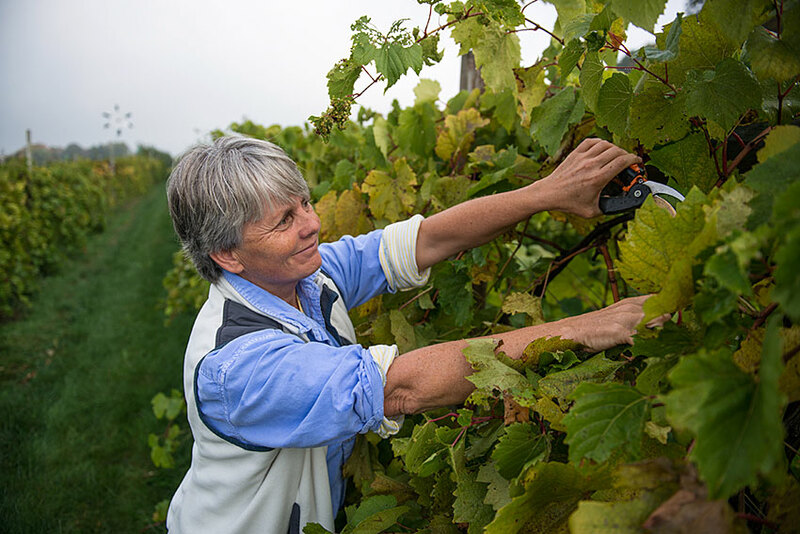 With grapes from vines Fritz planted, Phil and Joyce have added their hard work, Sonia’s wise advice, and the alchemy that is winemaking to produce new wine from old vines. And, those old vines are producing more than just wine. 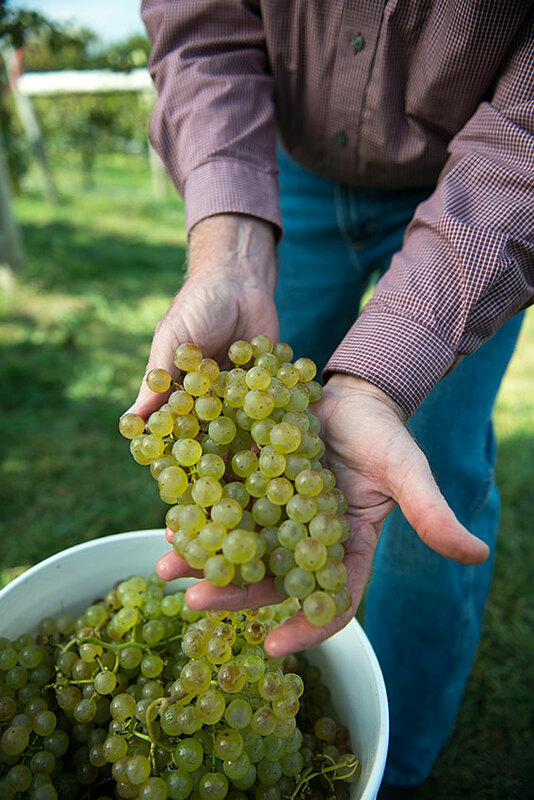 They also are producing the 60-something-year-old Wileys’ new career as winemakers, new knowledge for Sonia and her colleagues at Cold Spring, and inspiration for others contemplating a new venture in their later years.